Eagles go from 0 to 30… in 30 minutes! 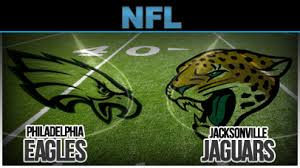 Things were not looking good for the Philadelphia Eagles in their Opening Weekend NFL game against the Jacksonville Jags. The Eagles, who many pundits feel can make a little noise in the NFC this season, were at home staring at a big fat 0 on the scoreboard at the end of the first half. They trailed the Jags, who were 4-12 last season, 17-0. Fortunately for the Eagles, they scored on their first two possessions in the second half and closed the gap to 17-14 as the fourth quarter began. They then shutout the Jags 20-0 in the final period on their way to a 34-17 win. What is interesting about the Eagles win is that the Eagles did something in that game that has only been done 25 times previously in the NFL. With no points in the first half and finishing the game with over 30 points (34 to be exact) the Eagles became only the 26th team in NFL history to be shutout in the first half and end the game with over 30 points. It’s also interesting to note that the last time this happened in an NFL game was last year… and it was done by the Eagles! Philly on December 8 last season was losing to the Detroit Lions 8-0 at halftime. They went on to score 34 points in the second half and won the contest 34-20. * The 26 teams that have accomplished this rare feat have won 24 of these games. * Of these 26 teams, 14 were playing at home, 12 on the road. * Four of these games went into overtime. * The Eagles became the fifth franchise in NFL history to have this “0-to-30” stat happen to them twice in their team history. The other four teams: the Bears, Broncos, Packers and Rams. * The Eagles have been on the other end of this stat three times (they shutout a team in the first half and then gave up 30-plus points in the second half). It happened in 1941, 1955 and 1971. * Twelve of these 26 teams scored 20 or more points in the fourth quarter. * This is the third straight season this stat has occurred. In addition to the Eagles this season and last, the New England Patriots did it in 2013. The Denver Broncos did it in 2012. * This was the second time this has happened on Opening Weekend. The other time was in 1982 when the Packers did it in a game versus the Rams. * The last time a team was shutout in the first half, scored 30 or more points in the second half and lost that game was in 2009 when the Minnesota Vikings were behind 16-0 to the Bears at half. The Vikes scored 30 points in the second half, but lost the game in overtime, 36-30.